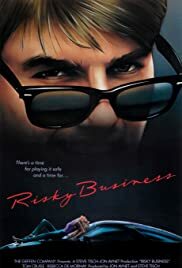 BEFORE: As a lead in to tomorrow’s advanced screening of Pitch Perfect, I’ve chosen another teen comedy, Risky Business. This is Tom Cruise’s second appearance in the marathon, the first being Top Gun. AFTER: Risky Business is like a crossover between Cruel Intentions and Ferris Bueller’s Day Off. If you recall, I did not like Cruel Intentions mainly because of its poor acting. Ferris Bueller on the other hand is one of my favorite comedies of all time. Unfortunately, Risky Business falls closer to Cruel Intentions than the John Hughes masterpiece. The film wasn’t as bad as Cruel Intentions. The acting was marginally better but still not anywhere near great. The writing was also a bit better but again, not by much. Things did start to pick up once the Princeton representative showed up at Joel Goodson’s (Tom Cruise) house. The funniest scene is when the Princeton guy interviews Joel as a party is going on in his house. Apparently I’m in the minority though. The film holds a 98% on Rotten Tomatoes and Roger Ebert even gave it 4 out of 4 stars. Like it or not, Risky Business has infiltrated popular culture with Tom Cruise’s famous dancing scene even being referenced on The Simpsons.